Avago Technologies has introduced the automotive industry's first RGB (red, green, blue) analogue output colour sensor that meets the specifications of the Automobile Electronics Council AEC-Q100 Stress Test Qualification for Integrated Circuits. Components meeting these specifications are considered suitable for use in the harsh automotive environment. In vehicle interiors, Avago's ADJD-E622-QR999 CMOS (complementary metal oxide semiconductor) analog-output sensor converts coloured light to accurate, proportional red, green and blue voltage outputs. These outputs can potentially be used for open-loop or closed-loop optical feedback for light sources in navigational panels, dashboard and interior lighting. The use of the ADJD-E622-QR999 in a closed-loop optical feedback system assures consistent colour and brightness for RGB LED (light-emitting diode) lighting and backlighting systems such as in liquid crystal displays. The combination of a colour sensor with RGB LED lighting replaces the limited range of colours available from conventional LEDs with a virtually unlimited palette of lighting colours. The combination can also be used to offer the driver a selection of lighting colours to reflect his or her preferences. The AEC-Q100 Stress Test Qualification indicates that Avago's RGB colour sensor offers a combination of robust packaging with low sensitivity to ESD (electrostatic discharge). This also assures its reliability in industrial, commercial and test equipment applications. The device is an excellent choice for uses ranging from bill acceptors for vending and change machines, to applications in the factory environment including colour matching paints, textiles and cosmetics; printing process control, contamination detection, and analytical measurement. 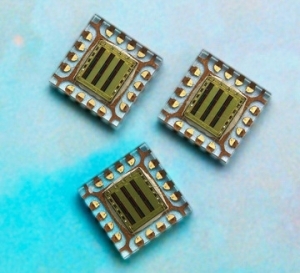 The ADJD-E622-QR999 is supplied in a lead-free QFN-16 (16-pad quad flat no-lead) surface-mount package with dimensions of 5 mm by 5 mm by 0.75 mm high. The height is 25 percent less than Avago's previously-introduced analog RGB colour sensor, which can help make printed circuit assemblies thinner to pack more functions in the same space. This CMOS RGB sensor features an extended storage temperature range of -50deg C to 105degC, and operating temperature range of -40degC to 85degC. It passes the automotive latch-up compliance standard, and offers an HBM (human body model) ESD rating of 8 kV and MM (machine model) rating of 200 V.
Avago's RGB colour sensor is a monolithic CMOS IC solution with integrated RGB colour filters combined with three sets of 3 x 3 photodiode arrays, one for each colour, which minimises the effect of contamination and optical aperture misalignment. The photodiode arrays convert the red, green and blue light components into photocurrents with transimpedance amplifiers then convert the photocurrent to analog voltages. The voltage output of each channel (R, G and B) increases linearly with increasing light intensity, and the gain of each channel can be independently set.